The Cagayan Electric Power & Light Co., Inc. (CEPALCO) would like to inform all customers of SCHEDULED SWITCHING POWER INTERRUPTIONS on Sunday, February 17, 2019 and on Monday, February 18, 2019 as shown below. 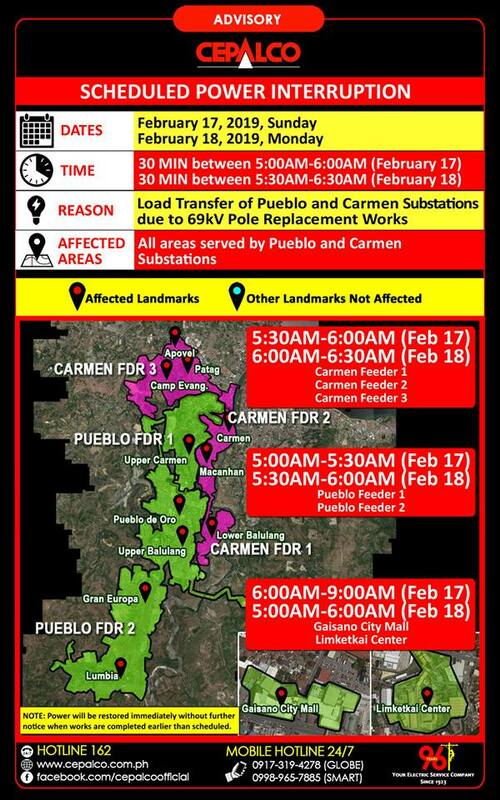 REASON : TO FACILITATE LOAD TRANSFER OF PUEBLO AND CARMEN SUBSTATIONS DUE TO 69KV POLE REPLACEMENT WORKS FROM CUGMAN TO LAPASAN AND HOTSPOT CORRECTION OF 69KV DISCONNECT SWITCHES. 1. Portions of Upper Carmen along Masterson Ave. towards Dagong including SM CITY; MANRESA/ SEARSOLIN; PRYCE HOTEL; & SPUM. 2. Landfill area from Dagong to Mother Ignacia Village including Sacred Heart Village. 3. Along Villarin St., Carmen up to Chinatown including St. Mary’s Academy, Sta. 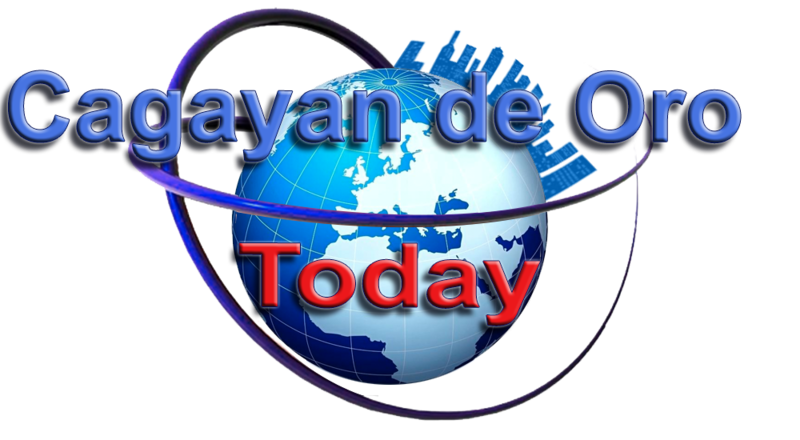 Cruz and Coop Village, Golden Village, City Hospital-DOH Area and Country Village Hotel. 4. Seriña St. from Villarin St. down to Madonna and Child Hospital. 5. Max Suniel St. from Villarin St. down towards portion of Mabolo St.; including Matilde Neri St., Dabatian St. and COC-Phinma area; and; portion of Lirio Extension area including Middleton. 1. ALL of UPPER BALULANG and of Brgy. LUMBIA including PNR Sawmill, Shop and Transmitter; Pueblo de Oro, Camella Homes, Xavier Estates, Xavier Heights, Xavier University High School, Golden Glow Village, Golden Glow North 1 & 2, Hillsborough, Philam Life, Morning Mist, ALL of GRAN EUROPA including Portico, La Mirande, Lessandra, La Buena Vida, Frontiera and Montana, Vista Grande & Vista Verde Subdivisions. 2. Lumbia Airport and BPC plant. 3. South Diversion Road from Rosevale School up to Nanuri School, CDO Convention Center and Ultra Winds. 1. Greater portion of Carmen Proper along Lirio St. from Trinity Tree St. towards Oak St., Max Suniel St., Vamenta Blvd. up to corner Jasmin St. including Waterlily St. and Carmen Market area. 2. Along Mabolo St. from Lirio St. towards corner Rosal St. including portion of Marigold St. from Mabolo St.
3. Portion of Carmen: vicinities along Vamenta Blvd. from Fernandez St. towards greater part of Ilaya including: portions of Ipil St. and Mahogany St. from Fernandez St.; Seriña St. from COA towards Gumamela Ext., Guani Coliseum and Maharlika Police Station. 4. ALL of MACANHAN, CARMEN towards all of LOWER BALULANG. 1. Portion of Carmen along Yacal St. towards Lirio St., portion of Vamenta Blvd from Poldo’s Lechon towards RN Pelaez Blvd., Waling-waling St. up to GSIS area including Ferrabrel St., Mango St. and portion of Rosal St. and Marigold St.
2. Liceo de Cagayan University and Georgetown Cybermall. 1. ALL of Brgy. PATAG including Calamansi Drive, Buenavista Village, CAMP EVANGELISTA, APOVEL and TERRY HILLS Subdivisions and Anhawon, Bulua area. 2. Along 6th Division Patag Road from Calamansi Drive up to Citi Hardware, Bulua near DPWH Depot. 3. Portion of Waling-Waling St. from corner Agoho Drive to Calamansi Drive. 4. Portion of Villarin St., Carmen from DOTC-10 up to National Irrigation Authority (NIA). Power will however be restored immediately without further notice when switching works are completed earlier than scheduled.